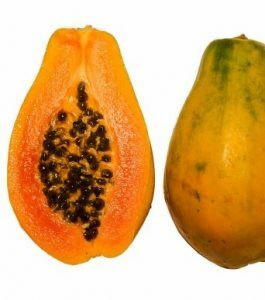 Carica papaya is an evergreen, tree-like herb, 2-10 m tall, usually unbranched, although sometimes branched due to injury, containing white latex in all parts. Stem cylindrical, 10-30 cm in diameter, hollow with prominent leaf scars and spongy-fibrous tissue. Has an extensive rooting system.